Alps - shader of the week contains 2 typos in line #262. I wonder why such bugs slip through in Shadertoy but not in GLSL Hacker? Some other shaders had to be fixed because of using reserved words like "char" or "case"
Today i was looking at some GLSL Sandbox demos. screws up the bottom of the screen. Also i took a look at misc. text shaders. And the models from the original location. 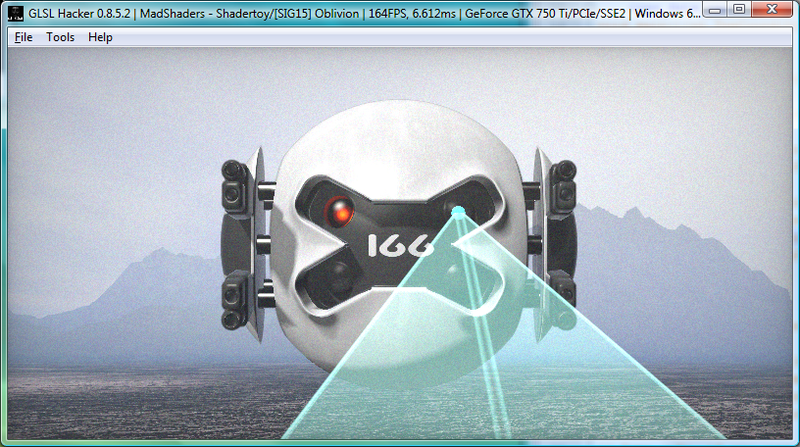 GLSL Hacker allocates 2.7 GB RAM with NVIDiA or 4.4 GB with Intel GPU for that model. It forgets some textures while rendering. My GTX 780 Ti Classified is faster than your 750 Ti but I got only 29 fps running Win 8.1 x64 with my CPU i5-2500K@4.5GHz because GLSL Hacker seems be not good optimized for mega polygons - CPU gets bottlenecked. I think that my videocard gets ~95 fps at ~95-99% GPU usage without CPU bottenecked. Maybe the Python part could be CUDA accelerated? Can you post a screenshot with your GPU? I wonder if you see more textures with more video RAM. 1800 MB VRAM. But my number of textures is equal to your. Should read again my post #27. - I'm sorry because I did badly about "quote". For JeGX or any guy: Has GTX 980 Ti same problem? Actually i was thinking about "PYCUDA". GLSL Hacker hasn't PyCUDA. I'll download "pycuda 2015.1.2", ok? How do I install this downloaded to GLSL Hacker?